Thank you for your continued support of RBA and the sharing of birdnews since 1991. Every day we send you hundreds of messages to provide you with up to the minute updates on birds and wildlife around the U.K. We’re proud to be your birdnews service of choice. The new SwiftAlert pager is manufactured to the highest standards in Switzerland by Swissphone and is an upgraded version of our popular s.QUAD pager, which we launched in 2014. 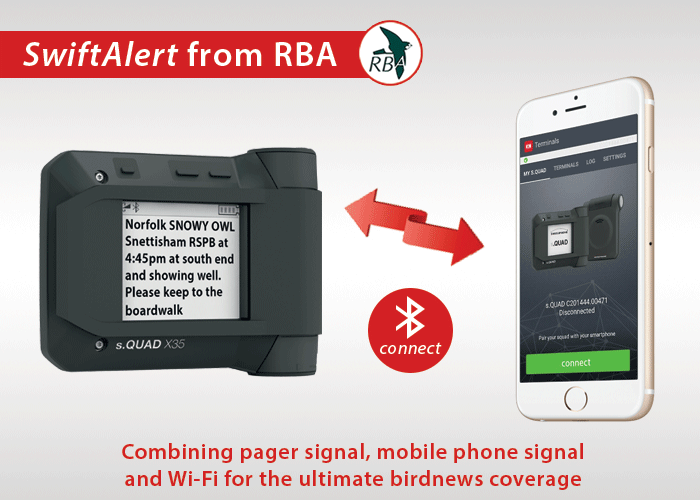 We have been able to update and greatly improve the RBA pager service, ensuring that you can continue to get the most reliable birdnews from the same dedicated team of birders that have served you thus far. Warmest regards and appreciation for your support.